Eiji Nizuma is a high school genius mangaka who has been drawing ever since he was young. Moritaka Mashiro and Akito Takagi consider him their rival. He was supposed to serialize a manga called Yellow Hit but he wanted to draw a different manga, Crow, which appeared in Akamaru Jump instead. His assisants were initially Nakai and Fukuda (Mashiro also worked for him temporarily before Detective Trap was serialized). His editor is Hattori Yujiro. He once demanded to be allowed to end one series he hated if he ever made it as the most popular author in Jump. Niizuma is slightly naive, but can also be serious and calculating when he wants to. Eiji tends to act conceited because he is hailed as a genius; however, after working on Crow for quite a long time, he grew more humble, even claiming to not be "good enough of a Mangaka to be judging other people's work" when asked by his editor to judge for the Golden Future Cup. (He judges anyway, but is not very helpful, only expressing his interest in Ashirogi and Ryu Shizuka). 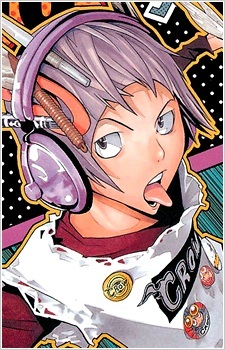 He tends to make noises and sound effects when drawing or writing his manga. Eiji is constantly chastised by his editor, and at first seems to be rather oblivious toward his rivals' feelings toward him, even expressing great excitement when he meets Ashirogi Muto and saying he is their fan. He is a great lover of manga and his opinion are valued by everyone at Jump, including his rivals. He refers to himself as an "Eternal Boy" and that is why he writes Shonen manga. He has only ever had a crush on one girl, back in elementary school, which paired with his naïveté most likely explains his lack of success in the Super Leaders' Love Fest.